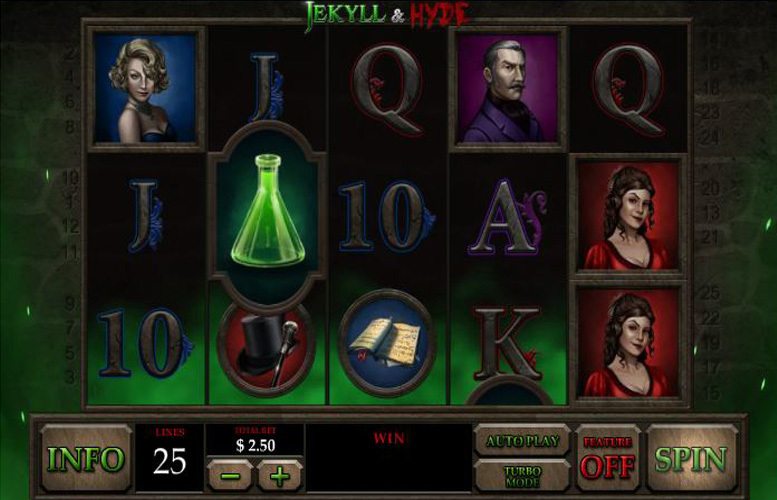 The Jekyll & Hyde video slot from Playtech is a real treat for fans of classic literature, spectacular bonus rounds, and macabre themed gambling experiences. It is, of course, based on the classic novel by Robert Louis Stevenson of the same title. Those who’re familiar with the book will expect a dark feel and look to the game, and they’ll not be disappointed. Incredibly innovative game features. The multiple bonuses on offer make the gameplay feel exciting and everchanging. Stylish looking machine with great animation. Players can only vary the value of bet they play per line. This means the minimum spin is higher than some machines, and the slot offers less control over betting sizes and spreads. Dr Jekyll = 1,000x the line bet. Either of the main women = 300x the line bet. Hat and cane, or Journal = 150x the line bet. The designers of Jekyll & Hyde have been incredibly creative when it comes to their bonus features. The machine is absolutely packed with innovative touches which really complement the theme, and the overall plot of the classic, transformative tale. Landing three or more scatters anywhere on the reels will trigger a free spin bonus. 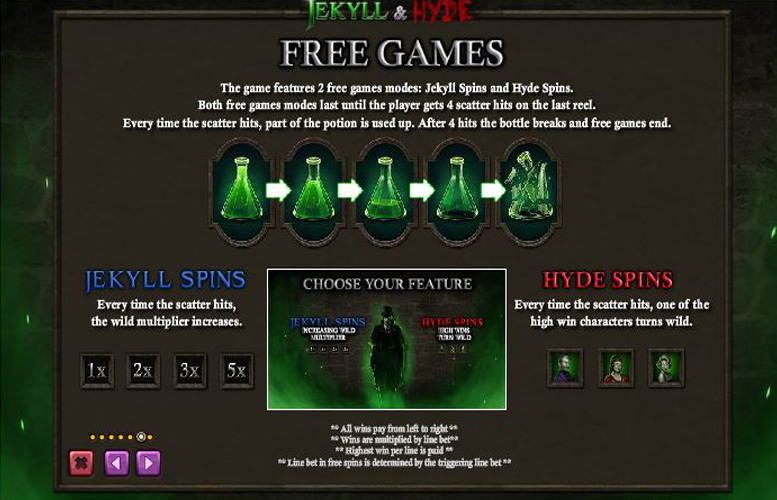 Players can elect to play as Jekyll, or as Hyde during the free spin bonus. What’s unique about this free spin bonus round is that it doesn’t specify how many are awarded. Instead, spins continue until the player lands the scatter symbol on the last reel four times. Each time, the conical flask empties slightly, until the potion is used up, and the flask itself breaks – this signals the end of the bonus round. As mentioned, players can elect which mode they wish to play in after initiating the bonus round. 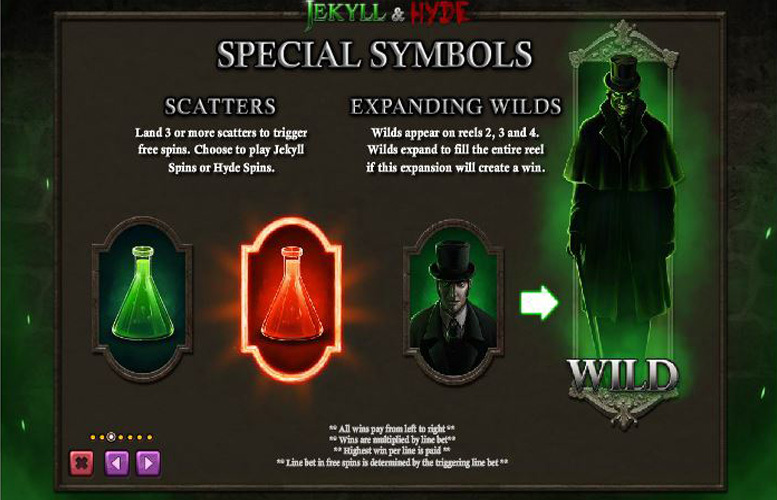 If they opt for the Jekyll bonus, they are rewarded with additional multipliers for each time the scatter emblem hits. The maximum possible multiplier is a handsome 5x. This can really send players’ total winnings skywards. Dr Jekyll’s abominable creation is famously a bit of a wild one. 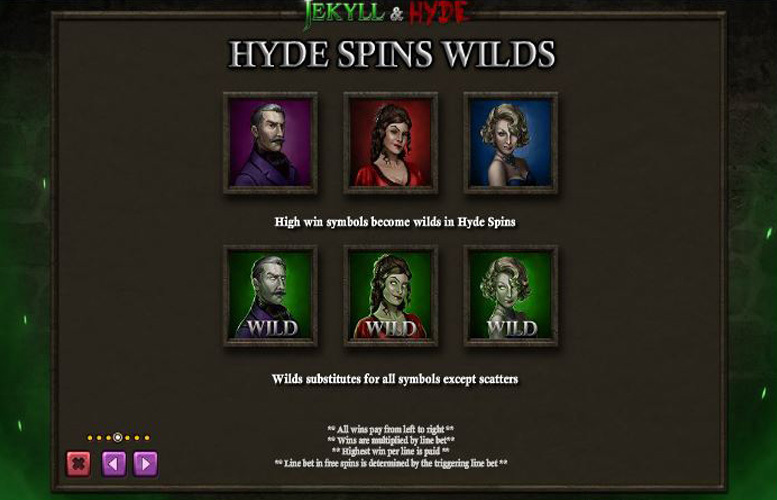 With that in mind, the designers at Playtech decided to make all the high value symbols capable of transforming into “wilds” during the Hyde free spin round. The symbol itself is replaced by a demonic version of the character with a green background, and naturally any spread of “wild” icons can dramatically increase the chances of winning big. The wild symbol (Mr Hyde) only appears on reels two, three, and four. These wilds will transform into the monster which fills the entire reel. This will only occur if the expansion will create a winning combination. If players enable the “feature bet” mode on the slot. The total bet is doubled per spin. This “powers up” scatter symbols, meaning they can still affect the game when not directly on the reels themselves. During any feature bet spins, landing scatter symbols either one reel above, or one below will also activate the bonus round. Powered up scatters are represented with a glowing border around the conical flask scatter symbol. Ace = 100x the line bet. King, or Queen = 75x the line bet. Jack, or 10 = 50x the line bet. 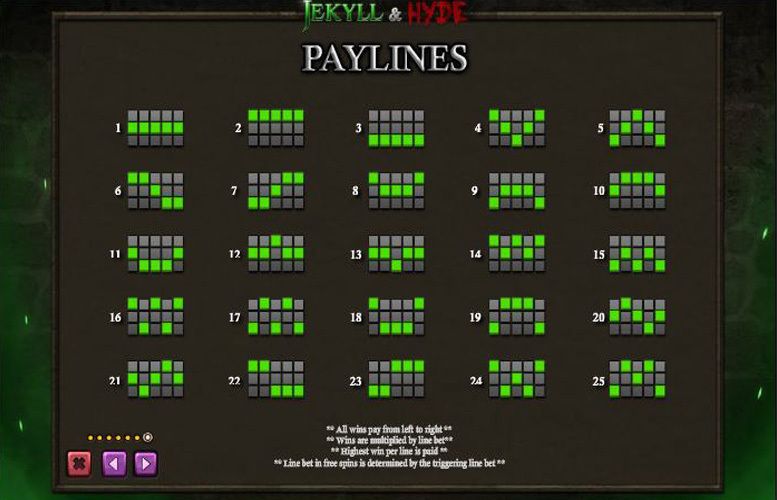 Being as the number of win lines is fixed on Jekyll and Hyde, the ways that players can vary their bets is somewhat limited. There are still plenty of options, just not as many as some other machines. The minimum bet per line is 1p, meaning a total cost of 25p per spin. Meanwhile, the maximum possible bet is a substantial £125 a spin (£5 bet per win line). Jekyll and Hyde showcases some of the ingenuity of Playtech’s most creative slot designers. The various bonus features not only make the game exciting but are also appropriate in the context of the Stevenson classic. The theme of transformation has been used to not only provide a slot with a stylish façade but one with great gameplay features. This helps make it a title with tremendous replay value, and players will likely find the slot entertaining for longer than they would some of its peers. This game has a rating of 5 / 5 with 761 total reviews by the users.